Wildflowers and raptors. Those are just two of the things that make this farm unique. 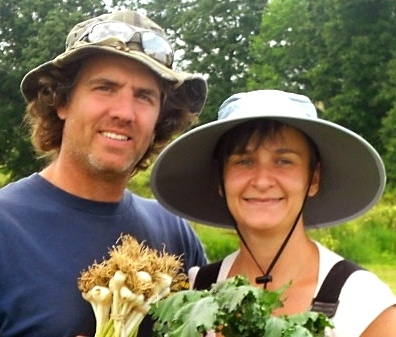 Six years ago, Sara and Joe founded Five Elements Farm, located 35 miles north of Pittsburgh. Before they bought it, the land was a conventional corn field and they have truly transformed it. They operate a productive market garden as well as a pastured poultry flock, and just as important, some of their land is protected habitat for native Pennsylvania flora and fauna. Who farms with you? Farming is a family affair. Joe does the brunt of the labor on the farm, while Sara manages daily household business. On Fridays she and a friend work in the fields and enjoy each other's company (these days are open to anybody who needs time to rejuvenate and get grounded!). Additionally, she is the farm photographer and writer, and is in charge of passing on information to customers and introducing new foods and recipes to them. Daughter Jordan is an enormous help during market days and our youngest, five-year-old Samson, loves to help drive the tractor. What do you grow? Do you have a specialty? We grow a wide variety of vegetables throughout the season: everything from salad greens, beans, herbs, garlic, onions, potatoes, tomatoes, cucumbers and squashes. There is nothing we would not consider growing at least once – and in all honesty, trying out new varieties is one of the joys of our life. We just added pastured hens to the mix! What are your markets? We sell at two local farmers markets (Tarentum, PA and Butler, PA) as well as some direct on-farm sales. On occasion, we sell to a few local restaurants; their response has been so positive, we will most likely increase these sales as well in the coming years. How long have you been farming? We have owned the farm since 2007 but only actively marketed and sold our produce for the last two years. Prior to 2007, our land was a conventionally grown corn field. We spent a year and half constructing a solar powered, straw bale home in which to live. How did you get into farming? We both grew up with our parents growing gardens in large cities. Joe has vibrant memories of squashing tomatoes and making sauce for a family with three growing boys. Sara remembers lugging up 5 gallon buckets of tomatoes and zucchini from the backyard into her mother's kitchen. Later, Sara began volunteering on an organic farm in 2002, as a “labor for produce” exchange. She spent her day with a group of women outdoors, and then took home bags of delectable produce! When we decided to purchase land together, we knew we wanted to grow as much as possible for our own family, and instill the love of fresh, honest food into our children. Then it became a natural extension to grow for our community. Why did you join CNG? We got involved with CNG because we wanted to reassure our customers that we were growing our produce in an organic and sustainable fashion. 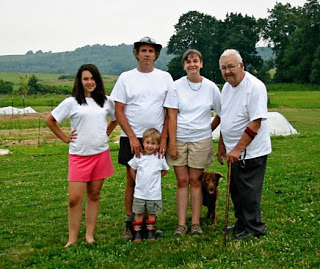 However, the burden and cost of USDA organic certification was too prohibitive for a small family farm like ours. Certified Naturally Grown was a perfect fit. Not only did it provide the quality reassurance for our customers but it allowed us to meet some other wonderful farmers in the region as well. What is the biggest challenge you've encountered as a farmer? Our biggest challenge has been a lack of labor combined with the needs of two active children (a teenager and preschooler), particularly at the height of the growing season. This has caused us not only to work longer hours in late summer, but to improvise and attempt to find ways to minimize labor needs. What tricks and solutions have you invented to address challenges or improve operations on your farm? We try to re-purpose or build things that help our shortcomings on labor or capital. 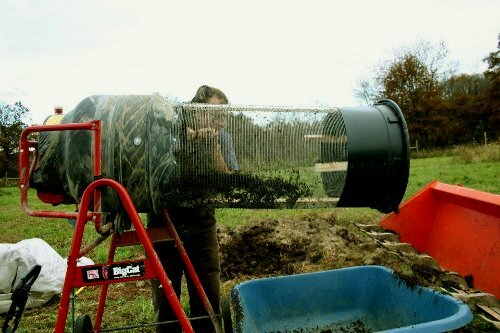 We have utilized an old bathtub as a vermicomposter and converted a used cement mixer into a compost screener (see the picture!). Since we do not have the capital to purchase a water wheel transplanter, we have built wooden jigs in order to properly space holes to plant garlic and other crops. What was your most positive farming experience? Our most positive experience is always the customer interaction at the farmers' markets. However, it has been intensely rewarding to lend to other farmers a helping hand when needed. The social exchange can really build you up at the height of the season, when it feels like a roller coaster has gone out of control! How do you further your farm learning? We are lifetime members of the Pennsylvania Association for Sustainable Agriculture (PASA), and they always provide on-farm workshops and other learning opportunities. We also subscribe to many publications (Growing for Market, Acres magazine) and online newsletters to keep us abreast of what is happening in the agricultural world both here in the U.S. and around the globe. Also, the many farmer friends we have met through CNG have provided us with opportunities to learn as well. Favorite vegetable? Black Cherry Tomatoes, and, most recently, Japanese Kakai pumpkins. Those tomatoes are consistently high producing and have phenomenal taste. The Japanese pumpkins have hull-less seeds that are addicting! What's special about your farm? One of our priorities is to make our land a sanctuary and preserve this beautiful Pennsylvania habitat. A driving force in our home is to respect nature's inherent processes and inhabitants. 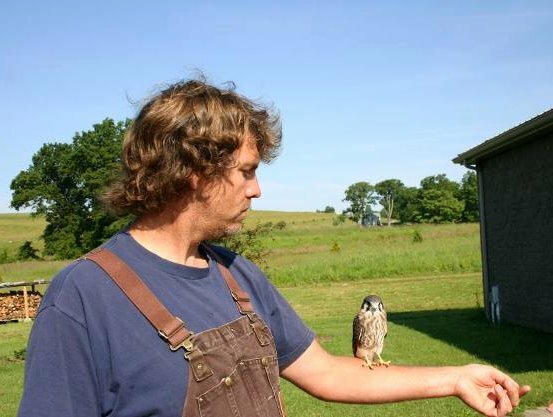 We allow some of our land to go to wildflowers and native plants all season, have developed a relationship with the local wildlife rescue association (they released four rehabilitated raptors on our land this past year), and plant as many trees as possible each spring. Our small pond is a magnet for wildlife, especially frogs, dragonflies, and the occasional Great Blue Heron. In return for our efforts, every year we see more numerous and varied wildlife on our property. Find Five Elements online on their website or on Facebook.